The Rune Shark Trap is a Hydro weapon. The Sunken City's best line of defense now becomes one of your best weapons of offense! Hidden behind a cleverly disguised rocky outcropping is a shark powered by re-oxygenating oxygen tanks! Triple the fins for triple the speed, racks on racks of razor sharp teeth coupled with a frickin' laser beam attached to its head! Equipped with hover fins for equally effective use on land! The Rune Shark Trap can be purchased from the Trapsmith in Sunken City for 18,000,000 gold, 800 Sand Dollars, 30 Runes, 100 Barnacles, 100 Mouse Scales, and 100 Damaged Coral Fragments, which will all be spent in acquiring the trap. It can be refunded at the same location for 3,200,000 gold. None of the other items spent to acquire the weapon will be refunded. School of Sharks - The Rune Shark Trap is a requirement for purchase and will be spent. 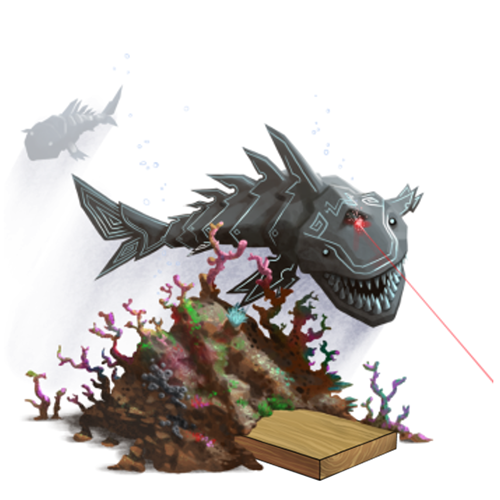 2 July 2014: The Rune Shark Trap was released with the introduction of the Sunken City. This page was last edited on 12 January 2019, at 13:39.